Some people don’t get enough sleep, the 7-8 hours recommended at night. Fortunately, for such people, Apple made a new feature available in the Clock app of iPhone – named Bedtime. This feature helps iPhone users get to bed on-time and track the schedule of their sleep. Also, it gives info that helps you sleep well on a consistent basis, as well as wakes you up at the right time. 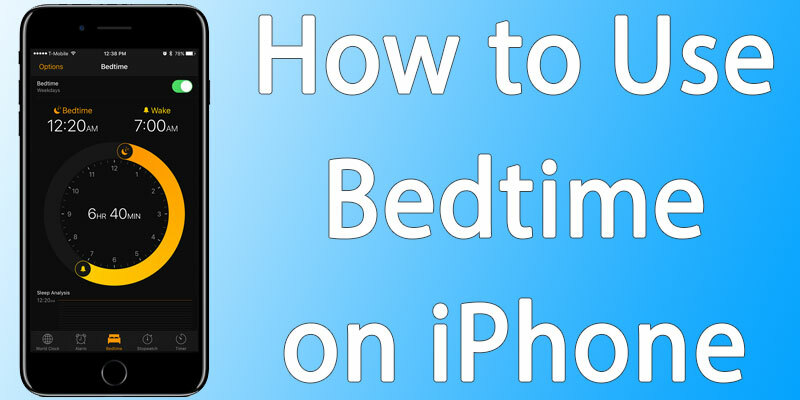 This article will highlight how to use the new Bedtime feature in the Clock app to improve your sleep. Make sure you are on iOS 10 to implement the tips, no additional app installations needed. For Bedtime to track your sleep properly, buzz your alarm, and send sleep reminders, you need to follow multiple steps. Launch the “Clock” app and tap “Bedtime” at the screen’s bottom. Tap “Get Started’ at the screen’s bottom. Enter the time you’d like to get up using the scroller present at the screen’s center and tap “Next” at the screen’s upper right-hand corner. The BedTime feature is going to sound the alarm every day of the week by default. From the screen, you can choose the days you don’t want the alarm to go off by tapping them. Tap “Next” to move forward. Choose the number of hours you want to sleep at night and tap “Next” to move ahead. Choose the time when you want the Bedtime reminder and tap “Next”. Choose the alarm sound you want to hear upon waking up and tap “Next”. That’s it. The app will follow the pattern you defined during the setup. But if you want to switch if off for a night, launch the Clock app, tap “Bedtime”, and switch the slider off. A large clock is there in the Bedtime menu; this can be used to adjust wake and sleep times by sliding the “alarm” and “wakeup” around the clock. This will adjust your wakeup times, so ensure this is set back up after weekend. Bedtime records the sleep schedule and syncs it with the Health app. The sleep patterns can be viewed at the bottom of the screen as a graph too. Bedtime is automated apart from these features. It’s a simple, no nonsense solution to getting a good night’s sleep.